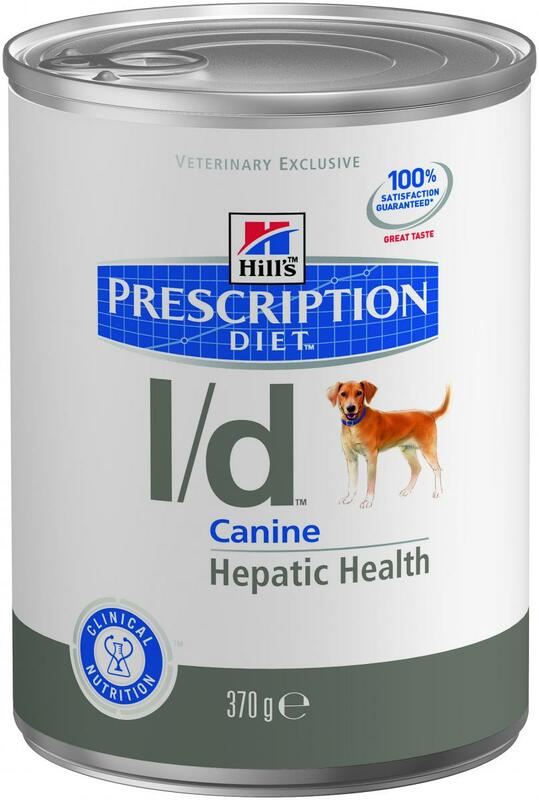 Hill's Prescription Diet l/d is a complete food that has been developed for the management of canine liver disease. Maintaining optimum liver health and function is essential as the liver is not only the largest internal organ but is responsible for eliminating toxins from the body and numerous other functions. Hill's Prescription Diet canine l/d has been formulated by veterinarians to target specifically dogs with liver disorders and is a highly digestible recipe, with rich protein sources to moderate the liver workload and aid in the regeneration of liver tissue. Prescription Diet l/d also contains added essential nutrients, including a combination of vitamins and selenium. These ranges are a starting point only, because dogs' needs vary. Adjust the feeding amount to maitain optimal body weight. Balanced Reduces workload on the liver. Reduces accumulation of ammonia and consequent CNS signs (hepatic encephalopathy). Copper Reduced Helps reduce copper accumulation in the liver. Soluble fibre Supplemented Helps decrease ammonia reabsorption in the bowel. Sodium Reduced Helps limit portal hypertension and ascites. Potassium Increased Helps avoid hypokalaemia which can trigger CNS signs. Please consult your veterinary surgeon before feeding your animal this food. Ingredients (Wet): Original: Rice, animal fat, soybean meal, soybean oil, dried egg, maize starch, maize gluten meal, digest, minerals, cellulose, fish oil, dried beet pulp, vitamins and trace elements. Ingredients (Dry): Original: Maize, animal fat, soybean meal, dried whole egg, flaxseed, minerals, digest, maize gluten meal, cellulose, soybean oil, dried beet pulp, vitamins, trace elements, L-carnitine, taurine and beta-carotene. With a natural antioxidant (mixed tocopherols). Dogs with hyperlipidaemia or pancreatitis, or with a history of, or at risk of, pancreatitis. 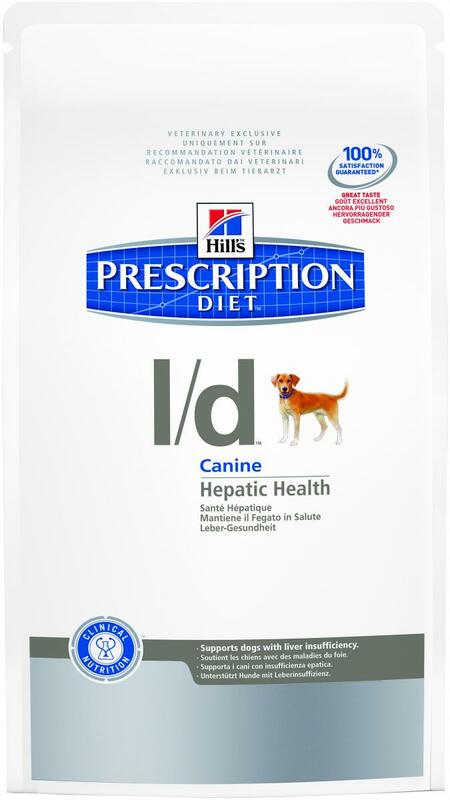 Below are some recent questions we've received regarding Hill's Prescription Diet l/d Liver Care Original Dog Food, including answers from our team. How do I interpret the symbols showing(?) how much to give my dog? There is a bag (?) symbol, and another one, usually with a "1" in it. How much do I give my 30kg retriever? A dog weighing 30 kg in the caned version would be expected to require between two and a third cans to three and a third cans per day. The same dog on just dried diet could be on 300g to 415g per day. These are just initial guidelines and all manufacturers tend to recommend quite generous amounts for average, well exercised dogs. It is always important to adjust the daily amount in response to the body "fat cover" of your own individual dog as time goes by. There is a huge amount of variability on how much food should be given so it is best not to rely on published guidelines beyond an initial trial period. After that you should increase of decrease the amount, depending on how thin or at your dog is. Retrievers tend to be hungry all the time unless they are over-fed, so you cannot rely on appetite. Always the correct amount to feed is simply that amount which produces the correct body weight. That is such a simple statement but it is by far the best guide you will ever come across.